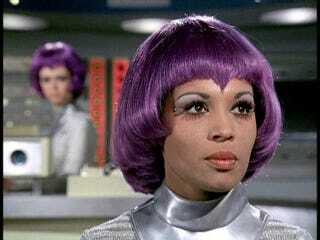 Did UFO kill Jackson while I was dazzled by purple wigs? Back to the future of 1980, or at least how it was imagined in 1969-70. I was watching an episode of Gerry Anderson’s UFO earlier, specifically The Man Who Came Back. It opens with one of the Moonbase girls directing Interceptors against an alien incursion. I didn’t readily recognise the actress in the sequence but it is credited to Dolores Mantez who played Lt Nina Barry in the show. For a moment I thought it was Wanda Ventham in the purple wig, but it wasn’t. Although somebody at SHADO (Supreme Headquarters Alien Defence Organisation) decided this was a uniform, Col Virginia Lake turns up a few minutes later in a variant edition of the catsuit but without the wig. Is that one of the perks of command? This installment kicks off with Astronaut Collins, played by Derren Nesbitt crashing during the attack and a UFO gets a shot off at SID (Space Intruder Detector), an orbital AI that provides an early warning for incoming nasties. The wounded satellite twisting painfully towards Earth before the show’s logo slinks over a freeze-frame is one of the most impressive teaser scenes going. Collins survives but returning to work he is not exactly getting on with his colleagues and no one seems to notice anything odd apart from another member of the Moonbase crew, Col Grey (Gary Raymond). He is snappy with Col Lake (Ventham) and manages to injure Col Foster (Michael Billington) before the mission to repair SID. The only other person qualified to make the flight is SHADO boss Ed Straker. Apparently Straker and Collins were the people who put SID in orbit to begin with. Grey suspects Collins will try to kill Straker but has no tangible proof. He finds an ally in psychiatrist Dr Douglas Jackson (played by Vladek Sheybal) who is waiting on a computer analysis of a scan that might prove alien influence. Dare I say, Jackson is one of the most interesting recurring characters in UFO. Apart from being the resident shrink, he seems to have a roaming portfolio for SHADO. On occasion he also seems to have his own agenda contrary to the rest of the organisation. Sheybal gave the character a sinister touch even when his actions are revealed to have the best intentions. Grey confronts Collins but gets battered into unconsciousness. At which point Jackson phones Collins’ flat to tell Grey he has the test results (as one does). Collins takes the call but says he is Grey when he answers. Jump to Jackson’s office where the psychiatrist is engrossed in paperwork. Suddenly Collins is behind him, glaring wildly, and well, that’s the last we see of Jackson. Was he knocked out, stuffed in a cupboard, posted off to the Jimmy Hoffa Retirement Home? Did they just kill off a significant character? Collins makes the flight with Straker (Ed Bishop) using NASA facilities rather than the SHADO space plane. Grey wakes up in hospital in time to phone in a warning. It’s just in time as Collins attacks Straker as they cling to the hull of SID. It’s unclear if Collins resists the alien influence but Straker pulls an oxygen pipe off his suit. Collins body floats into the black. Let’s stick with the girls in purple wigs.